The creation of data has seen exponential growth for the past decade forcing IT managers in a number of fields including, media and entertainment, healthcare, video surveillance, research and more to look for cost-effective short- and long- term data storage solutions. With these concerns in mind, this month the LTO Program announced the specifications of the latest LTO Ultrium format, generation 8, which is now available for licensing by media manufacturers. With unprecedented storage capacity and an impressive feature set, the LTO generation 8 technology will provide customers with a cost-effective storage solution that is both easy-to-use and addresses numerous storage needs. 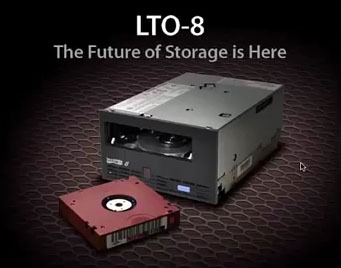 The new LTO generation 8 specifications will double the tape cartridge capacity from the previous LTO generation 7, with customers now being able to store up to 30TB of compressed data per cartridge. 12TB Native and up to 30TB compressed. LTO generation 8 will continue to support multi-layer security capabilities, including hardware-based encryption and WORM (Write-Once, Read Many) functionality. The partitioning functionality that allows users to present an easy-to-use tape- based file system with LTFS which will be also included in this generation. Quantum LTO-8 Tape Drive Internal SAS 12TB/30TB (Optional Add-On Drive for TC-L83CN-AR) Part# TC-L82GN-BR. Available at BackupWorks the Add-On Drive for the Quantum LTO-8 1U Rackmount SAS 6Gb/s Tape Drive. The Internal LTO-8 SAS Rackmount Add-on Drive.